Here are some snazzy birthday facts about 16th of April 2004 that no one tells you about. Don’t wait a minute longer and jump in using the content links below. Average read time of 10 minutes. Enjoy! What day was my birthday Apr 16, 2004? April 16, 2004 was a Friday and it was the 107th day of the year 2004. It was the 16th Friday of that year. The next time you can reuse your old 2004 calendar will be in 2032. Both calendars will be exactly the same! This is assuming you are not interested in the dates for Easter and other irregular holidays that are based on a lunisolar calendar. There are 360 days left before your next birthday. You will be 16 years old when that day comes. There have been 5,484 days from the day you were born up to today. If you’ve been sleeping 8 hours daily since birth, then you have slept a total of 1,828 days or 5.00 years. You spent 33% of your life sleeping. Since night and day always follow each other, there were precisely 186 full moons after you were born up to this day. How many of them did you see? The next full moon that you can see will be on May 18 at 21:13:00 GMT – Saturday. Fun stat: Your first one billion seconds (1,000,000,000) will happen sometime on December 24, 2035. If a dog named Athen - a Afghan Hound breed, was born on the same date as you then it will be 99 dog years old today. A dog’s first human year is equal to 15 dog years. Dogs age differently depending on breed and size. When you reach the age of 6 Athen will be 45 dog years old. From that point forward a large-sized dog like Athen will age 5-6 dog years for every human year. Spanish conquistador Hernando de Lerma founds the settlement of Salta, Argentina. The Battle of Culloden is fought between the French-supported Jacobites and the British Hanoverian forces commanded by William Augustus, Duke of Cumberland, in Scotland. After the battle many highland traditions were banned and the Highlands of Scotland were cleared of inhabitants. American Civil War: The District of Columbia Compensated Emancipation Act, a bill ending slavery in the District of Columbia, becomes law. American Civil War: Siege of Vicksburg: Ships led by Union Admiral David Dixon Porter move through heavy Confederate artillery fire on approach to Vicksburg, Mississippi. Manchester City F.C. was formed from Ardwick A.F.C. George W. Bush names April 16 as Selena Day in Texas, after she was killed two weeks earlier. India and Bangladesh begin a five-day border conflict, but are unable to resolve the disputes about their border. The trial for Anders Behring Breivik, the perpetrator of the 2011 Norway attacks, begins in Oslo, Norway. What does my birthday April 16, 2004 mean? 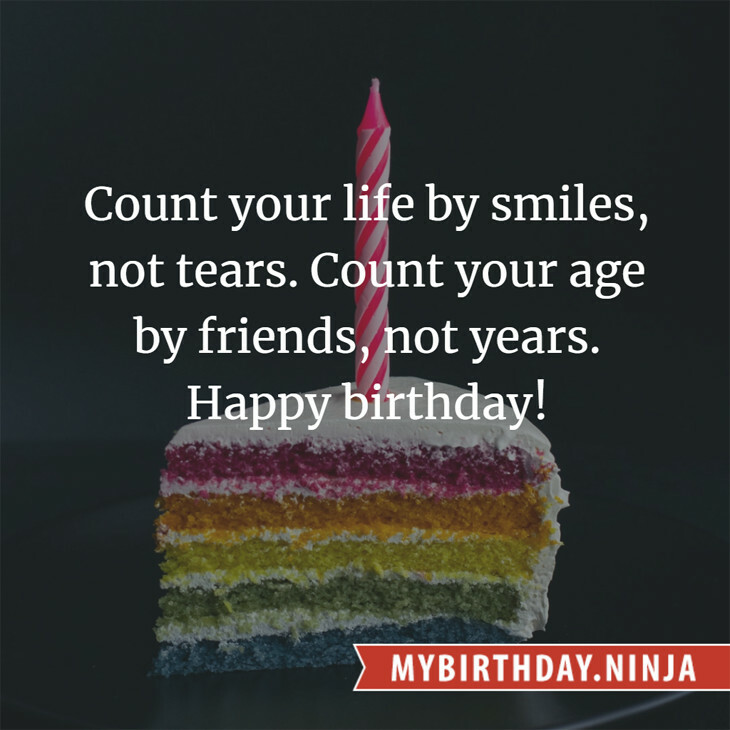 Your birthday numbers 4, 16, and 2004 reveal that your Life Path number is 8. It represents experience, authority and endeavour. You are gifted with natural leadership and the capacity to accumulate great wealth. The following celebrities also have the same life path number: Jason Narvy, Sonny Tufts, Jsu Garcia, Alun Armstrong, Tony Todd, Michelle Trachtenberg, Richard O'Brien, Martin Atkins, Sybil Thorndike, Du Juan. 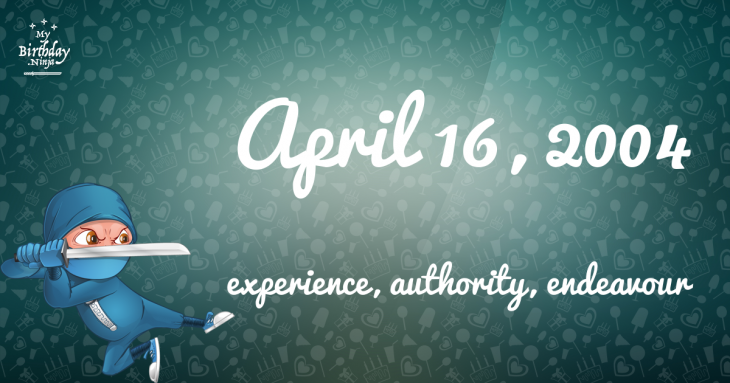 What is the birthday horoscope for Apr 16, 2004? The Western zodiac or sun sign of a person born on April 16 is Aries ♈ (The Ram) – a cardinal sign with Fire as Western element. The ruling planet is Mars – the planet of war and ambition. According to the ancient art of Chinese astrology (or Eastern zodiac), Monkey is the mythical animal and Wood is the Eastern element of a person born on April 16, 2004. Fun fact: The birth flower for 16th April 2004 is Sweet Pea for love. What is the Love Match for Apr 16, 2004? When it comes to love and relationship, you are most compatible with a person born on April 4, 2005. You have a Love Match compatibility score of +156. Imagine being in love with your soul mate. On the negative side, you are most incompatible with a person born on November 27, 1998. Your incompatibility score is -160. You’ll be like a cat and a dog on a love-hate relationship. Arf-arf, I want to bite you. Meow-meow, stay away from me! The number-one hit song in the U.S. at the day of your birth was Yeah! by Usher featuring Lil Jon and Ludacris as compiled by Billboard Hot 100 (April 17, 2004). Ask your parents if they know this popular song. I do not know how you feel about this, but you were a male ♂ in your last earthly incarnation. You were born somewhere around the territory of Poland approximately on 700. Your profession was digger, undertaker. How many babies were born on April 16, 2004? Base on the data published by the United Nations Population Division, an estimated 133,795,658 babies were born throughout the world in the year 2004. The estimated number of babies born on 16th April 2004 is 365,562. That’s equivalent to 254 babies every minute. Try to imagine if all of them are crying at the same time. What is the popular baby name on 16 Apr 2004? Here’s a quick list of all the fun birthday facts about April 16, 2004. Celebrities, famous birthdays, historical events, and past life were excluded. Try another birth date of someone you know or try the birthday of these celebrities: June 3, 1961 – Ed Wynne, English guitarist, songwriter, and producer (Ozric Tentacles and Nodens Ictus); October 12, 1981 – Brian J. Smith, American actor; March 4, 1981 – Gareth Knapman, English actor and director.